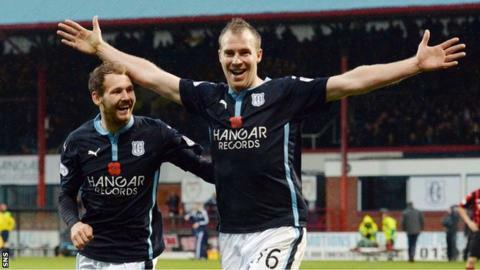 Dundee's prolific striker David Clarkson reckons a top-six league finish is becoming a more realistic goal for the Dens Park side. The Dark Blues have won three of their last four Scottish Premiership matches. "The aim probably was to get a good run of games and try and secure ourselves in the league," Clarkson told BBC Scotland. "But now we've done well and it's coming up to Christmas, maybe we look at re-evaluating where we want to be." And he added: "The top six is where everyone wants to be and there's no reason why we can't get there at the end of the season, but it's going to be hard." The 29-year-old forward after returning north of the border following a five-season stint in England, mainly with Bristol City. Motherwell, Kilmarnock and St Johnstone all had Clarkson on trial but opted not to sign him. "I don't think I've ever been on a run like this. Right from my first game I've scored and to make it seven in seven would be a great achievement for me." Dundee stepped in and the three-time capped Scotland international has been in sensational form since joining Paul Hartley's men, scoring in every one of his six appearances to date. "There's no secret, I don't think, just a bit of confidence," Clarkson said of his strike-rate. "Getting off the mark in my first game helped a lot. As a new striker the most important thing is to get a goal as quickly as you can." The Hamilton-born former Motherwell player has the chance to add to his tally against Celtic on Saturday. "It would be great to make it seven in seven no matter who it was against," said Clarkson. "From my point of view it's great, I don't think I've ever been on a run like this. Right from my first game I've scored and to make it seven in seven would be a great achievement for me. "I don't see why we can't take something at Celtic Park. We've seen other teams do it this season, so with the run we're on, why can't we go and do it? "We've got to be positive. If you go there thinking you've got to keep the score down, you've lost straight away, really."